All plants have stories. Perhaps the plant was Grandma’s favorite cut flower. Or it was that green bean variety passed down through generations of family gardeners. Or that pretty veronica whose name you learned on that hike at Mount Rainier. Every kind of plant has meaning to someone and every plant has stories behind it, whether historical or personal. One of those historical stories belongs to the Pacific rhododendron, the Washington state flower. Scientifically known as Rhododendron macrophyllum, it became the official state flower in 1959. The story behind that began decades before, in 1892. Back in 1892, Pacific rhododendron was instead known as Rhododendron californicum. Yes, scientific name changes are the gardener’s bane but there are usually good, even if obscure, reasons. In this case, it seems there was already an R. californicum so Pacific rhododendron would eventually be renamed to the current R. macrophyllum. Ironically, the real R. californicum was eventually renamed Hymenanthes californica. At the time, planning for the 1893 World’s Columbian Exposition had started. The national Women’s Congress determined to have a “National Garland of Flowers” at the event, showcasing every state’s symbolic flower. Since Washington had no official flower, several candidates were debated. Of course, Spokane’s wish was unrealized and the final vote came down to the clover and Pacific rhododendron. In a statewide election, Rhododendron californicum barely triumphed with just 53 percent of 15,000 votes. Interestingly, only women were permitted to vote for the flower for Washington state at the World’s Columbian Exposition — in a time when women were still not allowed to vote. The state Senate approved the vote in time for the opening of the exposition on May 1, 1893. For 56 years, Pacific rhododendron was the unofficial, de facto Washington state flower. In 1949, both houses of the state Legislature made it official. At that time, it was still known scientifically as R. californicum. 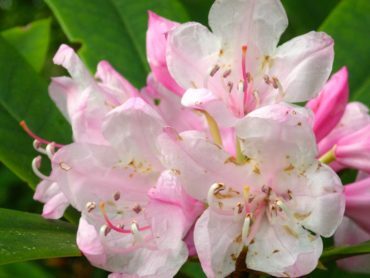 Ten years later, Leonard Frisbie, a Tacoma nurseryman and founder of the Pacific Rhododendron Society (no longer in operation), successfully petitioned the Legislature to change the state flower designation to reflect the correct scientific name as Rhododendron macrophyllum. 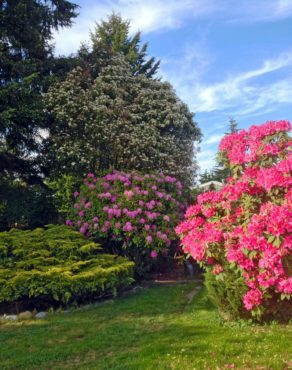 The history of human interaction with Pacific rhododendron did not begin with its selection as the Washington state flower. It is not known exactly when it first appeared in the Pacific Northwest. To date, no unequivocal fossils of this species have been discovered. 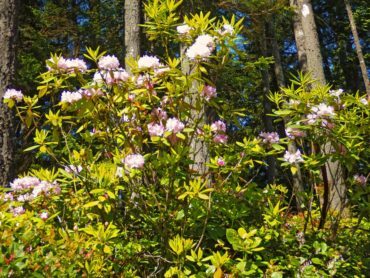 Theoretical estimates of past climate and geography in the region suggest favorable conditions for Pacific rhododendron growth along the Oregon coast as far back as the Pliocene, placing its potential age in the Pacific Northwest to between 3 million and 7 million years ago. 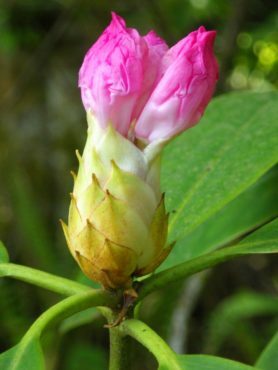 Fast-forwarding through time to human occupation of the region, uses of Pacific Rhododendron among Native American cultures in the region appear to be largely unknown. It is unlikely to have been used as a food plant due to the near-universal toxicity of Rhododendron species. In 1792, Scottish plant explorer Archibald Menzies encountered this plant at what is now Discovery Bay near Sequim while serving as naturalist and surgeon under Capt. George Vancouver on the H.M.S. Discovery. Later in the mid-1800s, seed was sent back to England. The species has been used as a parent of various horticultural Rhododendron hybrids since then. 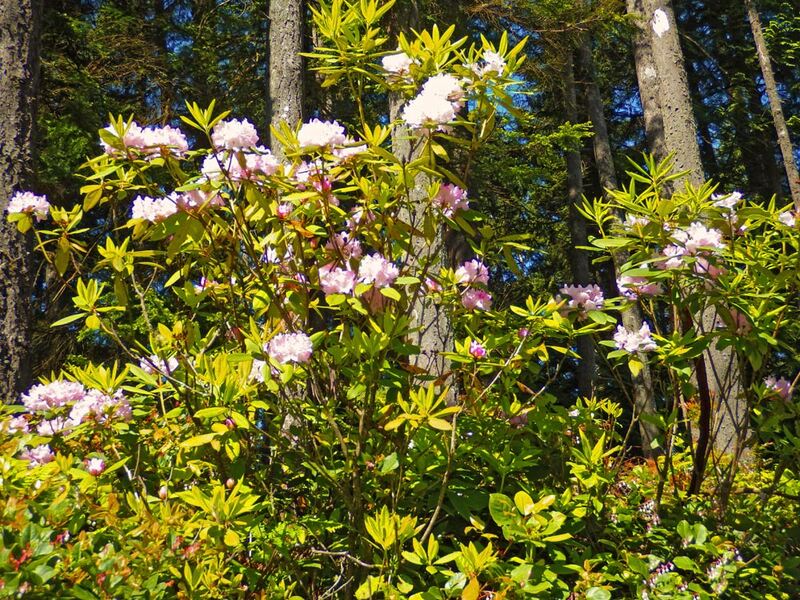 In the wild, Pacific rhododendron can reach up to 30 feet tall, although that is uncommon. In the West Sound, it is more often found up to 10 feet tall in drier sites, often along road cuts at the edge of woods. Finn Hill road in Poulsbo is a good place to find it blooming, usually in May. Populations can be found from British Columbia southward, with a more contiguous range from the Oregon Cascades to the southern Oregon coastal forests to coastal northern California. Within Washington, its natural range is largely centered on the Kitsap Peninsula and the surrounding areas of the eastern Olympic Mountains and the east side of Puget Sound. In the wild, Pacific rhododendron prefers drier sites with some shade. It usually shies away from open areas and does not like its roots in boggy soil, where it is prone to root disease. Like some other rhododendron species, it seems to do well in disturbed areas such as roadsides flanked by trees. Where it is planted or found in favorable areas, it will reseed itself, providing free plants for gardeners who introduced it to their yard. Pacific rhododendron resembles many other rhododendron species and even most non-gardeners identify it as a “rhododendron.” The flower clusters typically are light pink, although the natural range of variation runs from dark pink to white. The leaves are long-elliptic to oblong, like many other species. 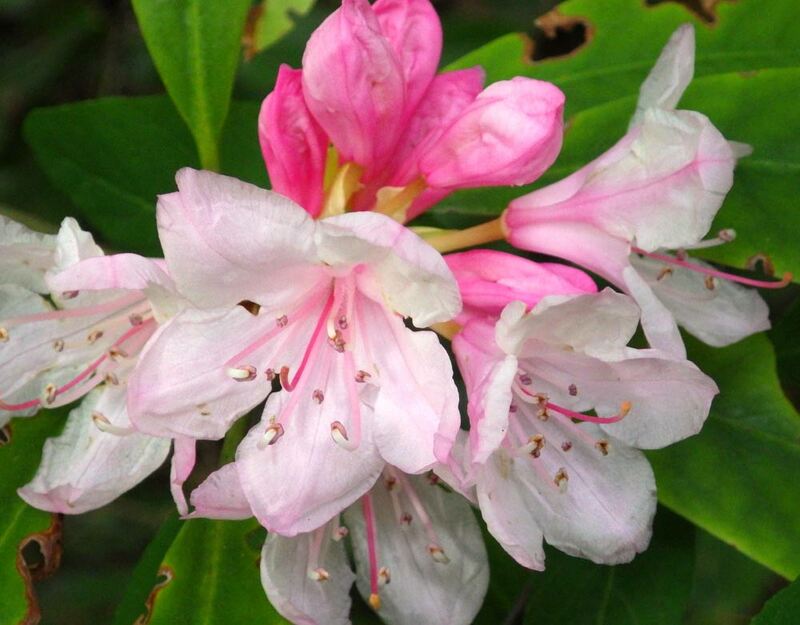 The overall appearance is of a standard rhododendron growth form that is very open in the shade, to slightly more compact in higher-light levels. 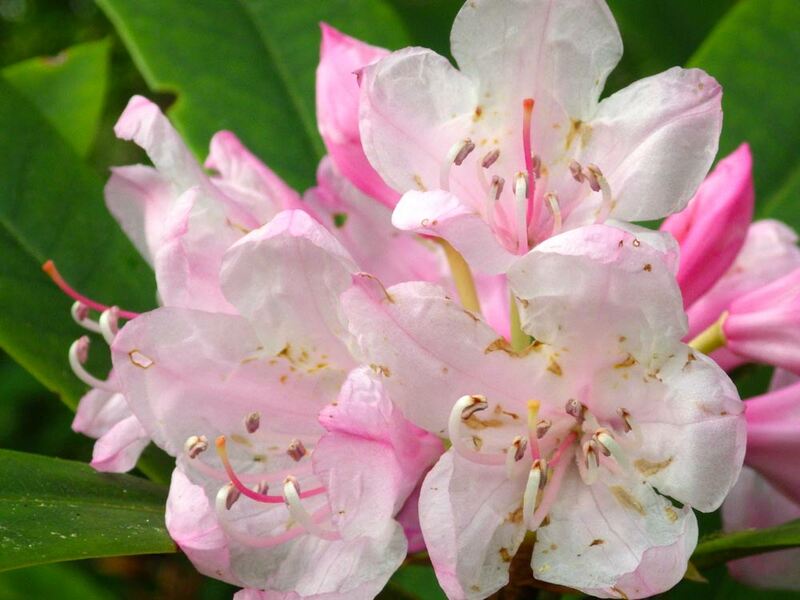 Provided the plants are given enough shade and adequate water once established, and planted in well drained soil, Pacific rhododendron will do well in your garden. Like most rhodies, it will handle light to moderate pruning fairly well but will almost always look terrible afterward. It is best planted in areas where it will not need regular pruning for size. For a garden choice, the Pacific rhododendron has a lot going for it. Besides having beautiful flowers and nice foliage and being easy to grow, it has an interesting story and would make a good garden conversation piece. Check the native plant sections in local nurseries to purchase your own piece of state history. With a B.S. in horticulture, and an M.S. 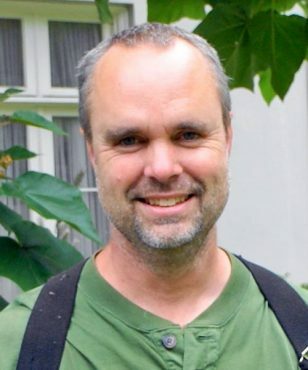 in botany, Darren Strenge is the plant health manager for the beautiful, 150-acre Bloedel Reserve garden on Bainbridge Island. He oversees irrigation, deals with pest and disease issues, and manages their compost program. He lives in north Kitsap County with his family and various animals.